I've added the ability to see and edit Common Knowledge edits across languages. Clicking on "Catalan" brings up the Catalan CK edits. 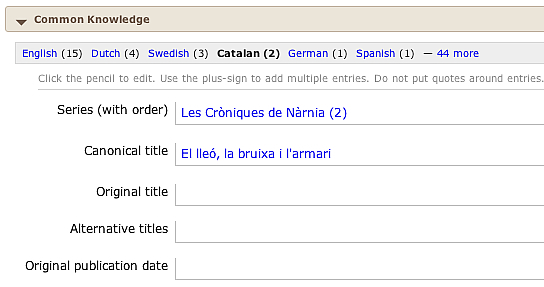 Needless to say, if you're in the Catalan site, you get the Catalan ones by default, and click to see the English ones. Click "X more" to edit CK for all the other LibraryThing languages. Where this is going: This is the first of two-three CK changes I am pushing forward on, all related to languages. This exposes the situation and is, I think, a good idea on balance. But it also exposes the problem—extending CK across LT languages is a bear. We've discussed various solutions in the past. I will be pushing one of them through as soon as I can do it. NB: I haven't extended it to the CK subpage on work pages. For some reason they use a completely different function. I need to grab some of Chris' time to figure out why that is. Will this work for authors, too? This is SO GREAT. I upload mostly stuff in French. Now I can do so without having to log out! Wow! That's amazing! You guys are the best. Seriously. Note: Neither feature extends to authors yet. I want to fix bugs before I spread the feature too widely. This is great news! Kudos. ... I totally thought this was a bug when I saw it. Good thing I checked here before posting a bug report! The reason I thought it was a bug: For works that don't have any CK data, it shows "— 49 more". Which makes sense if you know it's supposed to be listing language-data... not so much if you don't know that. It just says "49 more", not *what* the 49 more is or why it's there. It looks very, very out of place and confusing that way. Any way to change what shows up when the work has no CK? Yeah. I got rid of it entirely if there's no data. I had that error all day (on the Swedish site) but it just went away for me. I started a bug thread about it. It's the 20th of January, and Christmas Day has already arrived. Thank you! Doesn't matter what language, I always have to click "See More" to edit. This includes my default (English). Not sure if that matters. 16> I get that too, in IE: all of the CK info is hidden until you expand the language list. It works just fine in Chrome, though. I predict Tim will say "Oh sorry. I'll fix that." Oh, sorry. I'll fix that. The basic rule for CK on split authors is to have it apply to the largest author, which should also be the number 1 author. This doesn't change site-to-site. Really? That's a rather significant change from the previously stated rule, which was to have CK for split authors only if one was significantly larger than the rest; if one had 600 copies, and another had 20, then it was fine to fill it in, but if one had 600 and another 500, it should be left blank, because to do otherwise would put wrong data in front of a significant number of people. Should we change this, so that now even if it's close, majority still wins? Fixed a bug related to Author CK. Check out the thread, which asks for help. This is a language related difficulty which I may be posting in the wrong place, if so I appologise. I have reached a point in my "adding books" where I want to add to my library a large number of older books. Some are related to Scots Gaelic language stories but the books have passages of text in English. Some are dual text (page in Gaelic - facing page is English translation and some are purely in Gaelic (Scots not Irish) and were published as such (no English in them at all). Most are 19th century some are early 20th century some are 18th century. The Primary Language box makes no allowance for Gaelic (not one of the choices). Is there some way I can enter text in the language box myself? There is no point me entering these books into my library if the detail says they're English texts when they're not. I would appreciate a 'steer' as to where I should post this question if this is the wrong place. You can actually put Gaelic in any of the three language boxes (primary, secondary, and original). But it's not in the short list - you will have to click "show all languages" (below each of those boxes). (Strictly not the right place, since that's "edit book" language instead of CK language. But never mind).